Martian weather and soil conditions that NASA’s Curiosity rover has measured, together with a type of salt found in Martian soil, could put liquid brine in the soil at night. Perchlorate identified in Martian soil by the Curiosity mission, and previously by NASA’s Phoenix Mars Lander mission, has properties of absorbing water vapor from the atmosphere and lowering the freezing temperature of water. This has been proposed for years as a mechanism for possible existence of transient liquid brines at higher latitudes on modern Mars, despite the Red Planet’s cold and dry conditions. 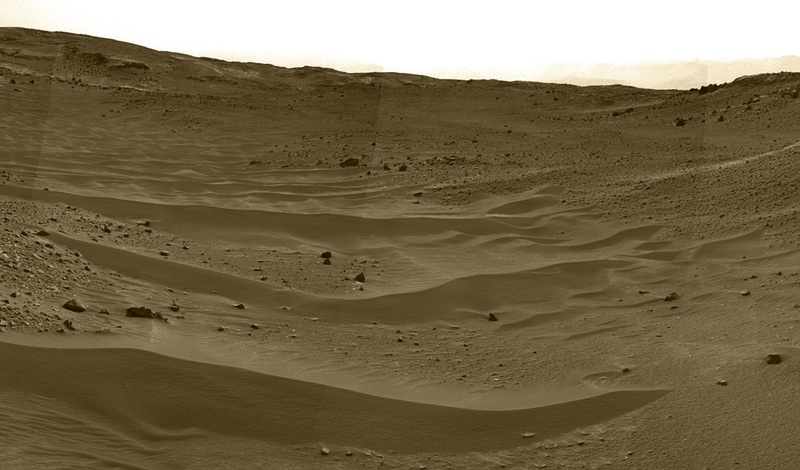 New calculations were based on more than a full Mars year of temperature and humidity measurements by Curiosity. They indicate that conditions at the rover’s near-equatorial location were favorable for small quantities of brine to form during some nights throughout the year, drying out again after sunrise. Conditions should be even more favorable at higher latitudes, where colder temperatures and more water vapor can result in higher relative humidity more often. The weather data in the report published today in Nature Geosciences come from the Cuirosity’s Rover Environmental Monitoring Station (REMS), which was provided by Spain and includes a relative-humidity sensor and a ground-temperature sensor. NASA’s Mars Science Laboratory Project is using Curiosity to investigate both ancient and modern environmental conditions in Mars’ Gale Crater region. The report also draws on measurements of hydrogen in the ground by the rover’s Dynamic Albedo of Neutrons (DAN) instrument, from Russia. Curiosity is the first mission to measure relative humidity in the Martian atmosphere close to the surface and ground temperature through all times of day and all seasons of the Martian year. Relative humidity depends on the temperature of the air, as well as the amount of water vapor in it. Curiosity’s measurements of relative humidity range from about five percent on summer afternoons to 100 percent on autumn and winter nights. Researchers using the High Resolution Imaging Science Experiment (HiRISE) camera on NASA’s Mars Reconnaissance Orbiter have in recent years documented numerous sites on Mars where dark flows appear and extend on slopes during warm seasons. These features are called recurring slope lineae, or RSL. A leading hypothesis for how they occur involves brines formed by deliquesence. In the 12 months following its August 2012 landing, Curiosity found evidence for ancient streambeds and a lakebed environment more than 3 billion years ago that offered conditions favorable for microbial life. Now, the rover is examining a layered mountain inside Gale Crater for evidence about how ancient environmental conditions evolved. JPL, a division of the California Institute of Technology in Pasadena, manages the Mars Science Laboratory and Mars Reconnaissance Projects for NASA’s Science Mission Directorate, Washington. 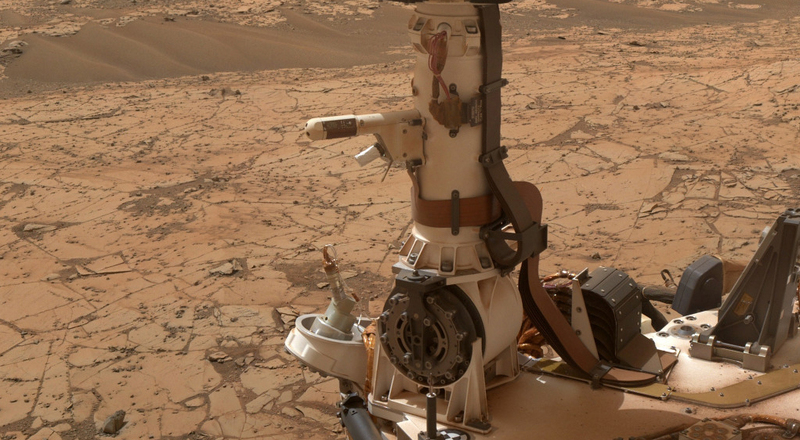 The Rover Environmental Monitoring Station (REMS) on NASA’s Curiosity Mars rover includes temperature and humidity sensors mounted on the rover’s mast. One of the REMS booms extends to the left from the mast in this view. NASA’s Curiosity Mars rover used its Navigation Camera to capture this view on April 11, 2015, during passage through a valley called “Artist’s Drive” on the route up Mount Sharp.